I'm Larry Sombke, host of Northeast Public Radio's "Gardening with Larry Sombke" heard every other Thursday at 2:00 p.m. on Vox Pop with Susan Arbetter. If you are anywhere within a couple hundred miles of Albany, NY you can hear us at 90.3 FM. 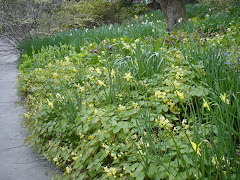 I have my own Web site www.beautifuleasygardens.com where I have posted tons of great information about gardening and lawn care, but I really wanted the immediate information flow of a blog so I could bang out good garden information at the drop of a hat. If you have comments or questions about my blog or about gardening in general, contact me at my Web site.